While participating in a SF Super Series event is an incredible experience and no doubt personally fulfilling, fundraising is an important and crucial part of the SF Super Series journey. All money raised by you during the campaign will go towards helping the Foundation realise its vision to fund research so a cure can be found in time for children battling Sanfilippo today and those born with it tomorrow. As part of joining our SF Super Series Team you will be setup with a fundraising page (as part of your registration) and a commitment to raising a minimum amount of $1000. This might sound like a lot of money but once you start fundraising you will be surprised at how quickly it tallies up. Fundraising takes a little creativity and persistence but is easier than you think. Remember, you are not on your own. As always, this is a team effort! We will help you with fundraising ideas, how-to's and lots of tips and tricks on seeking sponsorship so you can reach your target! This means starting a fundraising page on the SF Super Series platform, which allows you to set targets, add your photo, a story about your participation and why you want to help make a difference to the lives of children battling Sanfilippo. We have a really handy SCF Peer to Peer Tip Sheet updated Apr 18.pdf to give you tips on how to run a successful network fundraising campaign. There are tips on getting the all-important ‘ask’ just right, using social media to maximise donations and re-engaging with your close contacts via email. Make sure you have a read! We know from experience that a campaign’s success is thanks, in large part, to a series of smaller fundraisers held in the weeks prior to the main event. These range from office morning teas and gold coin collections at your school/university or workplace through to larger scale events such as a team dinner or trivia night. This is where you can get really creative! Each of these events provides not only a great opportunity to help your overall fundraising tally, but also a chance to raise awareness for the Sanfilippo cause. Hosting a cake stall at your child’s school, sports club, local markets or your nearest Bunnings store can be a quite profitable exercise. Do it as a team, ask friends and family to help you bake and sell on the day. 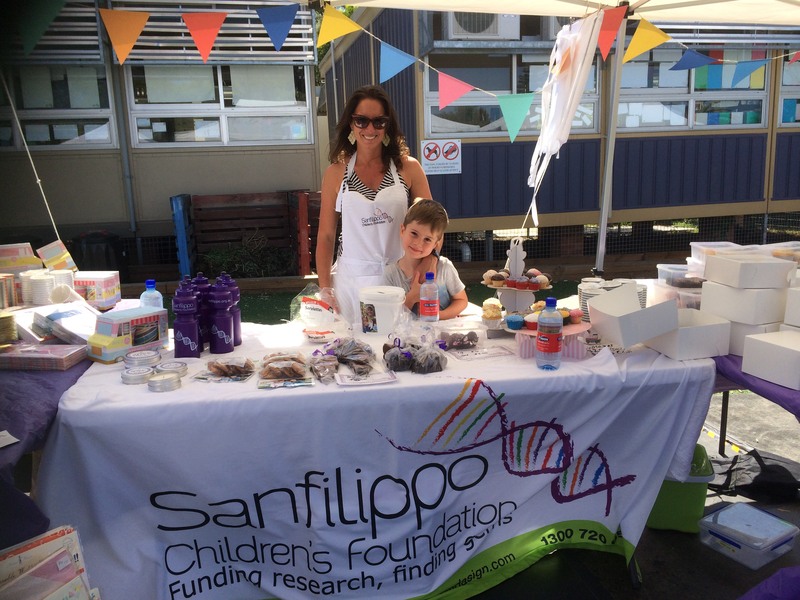 Download our handy Bunning’s Sanfilippo Fundraising Cake stall Guide complete with recipes. A movie night is a great excuse for a night at the flicks with friends while raising funds. The idea is you invite your network and utilise the gathering to raise funds off the movie tickets, confectionery/catering sold on the night. The following cinema chains work with charities. Plus read this article on how to make your movie fundraiser a success. If you live in Sydney, the Foundation has pre-booked several BBQs at Bunnings Balgowlah in 2019. Get your team along to help on the day and you can each add a percentage of the profits to your tally. We help with providing all the supplies. Email us at hellp@sfsuperseries.com.au if you are interested in being involved in BBQs! If you live in another area and want to do a BBQ at your local Bunnings, we can help you with the required paperwork for your application. If you're not in the Northern Beaches area of Sydney, let us know your local Bunnings store and we can try and put a request in for you. These BBQs are allocated months in advance so get in quick! You can host a BBQ at some Woolworths stores, (just ask your local store manager for an application form) and also some Bendigo Bank branches. Another option for fundraising is sponsorship of the SF Super Series campaign by businesses within your network. This approach means not only do you raise money for the Foundation but it is a chance to deliver business value to commercial supporters on a number of fronts including brand exposure, value alignment with a great cause, and community engagement. Many corporates not only encourage their employees to donate to not-for-profits but will sometimes match those efforts. Employee gift matching is donations an employer makes to match its employees’ charitable contributions. So you could effectively have your SF Super Series tally matched by the company where you work. Usually this is done dollar-for-dollar but some companies will double the original donation. Employee gift matching guidelines and amounts will obviously vary from company to company. Ask your HR department or boss if your company offers gift matching. If it doesn’t officially, ask your boss or employer to consider matching anyway or to personally make a donation. Aligning your company with a cause like ours is good PR, and if you ask you may well get a yes!